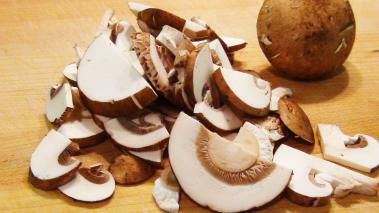 Slicing mushrooms, or any vegetable really, is no great miracle. It’s just slicing vegetables. But I have seen some techniques that truly make me cringe. Most important, using sloppy knife skills and a poor technique can be unsafe, but it can also be slow, and give you an inconsistent finished product, that makes creating a great dish more difficult. In this video, I show you how to slice mushrooms quickly and safely with “the proper” knife skills.